A total of 200 million hryvnia (about $8 million) has been allocated for fortifying the Ukrainian border in 2016. In 2015, 400 million hryvnia was spent on upgrades to the country’s border with Russia. Ukraine has fortified its border with Russia in the Kharkov and Chernigov regions with more than 120 miles of anti-tank trenches and about 43 miles of metal fencing. These upgrades were announced by the press center of the State Border Service of Ukraine. 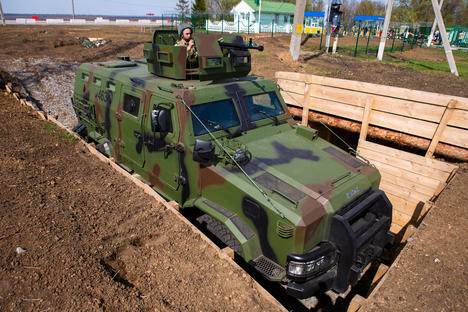 According to the press service, 200 million hryvnia has been allocated for fortifying the border for 2016. A year earlier, 400 million hryvnia were allocated for these purposes and the funds were completely spent. On May 14, 2016 Georgy Tuka, the deputy minister for the Ministry of Temporarily Occupied Territories and Internally Displaced Persons of Ukraine, reported the start of construction of the “wall” between the Lugansk Region – a territory controlled by Ukraine – and Russia. “Brigades of geologists and land surveyors have already arrived and ground-probing and preparation work for the technical project are now underway,” Tuka said. The idea to reinforce the border with Russia was first proposed in September 2014 by the then Ukrainian Prime Minister Arseniy Yatsenyuk. According to the plan, almost 1,200 miles of the state border would be equipped with anti-tank ditches, observation towers and signaling systems, as well as fortified stations for border guards. Up to 4 billion hryvnia (about $160 million) have been allocated for these purposes until 2018.